My eye was blacked out as it is very graphic. ADOPTED: I have found my forever home!! I also have 2 4-legged siblings at home a sister and a brother!! I love them too, Mom said we were going to bond on the way home!! I love bonding!!!! Life is great!!!! My new mom!! Life is Wonderful! I have had a horrible life so far and finally when I think things are turning around I had a crisis. I was owned by a family who bred me to make money selling my puppies and during my horrible life with the family my eye was poked with something I do not remember what, but I have been in constant pain since it happened!! Finally my owners decided they no wanted me so they put in on Craigslist Free to a Good Home. 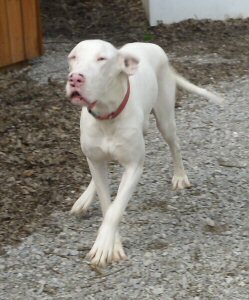 Lucky for me a wonderful person came for me and immediately got me to the Animal Friends Humane Society in Butler County Ohio. I was checked out by their vet and a Ophthalmologist and put on antibiotics. My surgery to remove my eye was scheduled for a week later. During the surgery my eye socket started bleeding uncontrollably and I was rushed to MedVet for emergency surgery. Now I am needing your help!! The surgery will cost between $1900 and $2600 and the Animal Friends Humane Society nor Harlequin Haven can afford this surgery. PLEASE can you help me!!! I really want a chance to have a life and not to be in pain! I want a family to love and care for me like I so deserve!! Please can you help me????? Any amount will be appreciated. My pictures are very graphic please think twice before opening unless you are prepared. My pictures are NOT recommended for children under 18 years of age. Click here to see my pictures. Note: 1 updated picture has been added. UPDATE: The wonderful vets at MedVet have waived their fees my surgery will NOW cost around $1000 - $1500. 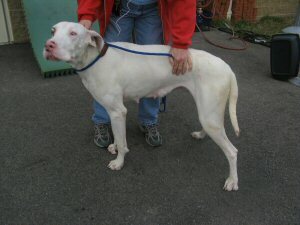 (A better explanation has been requested: the vets waived their personal fee's, Gianna was in surgery for over and hour so you have the cost of the surgical techs, the anesthesia, the equipment and all other cost related to surgery, then there are the cost for after surgery monitoring, IV's, the vet techs and after care. Unfortunately nothing is this world is ever free. UPDATE: So far $105 has been raised towards my surgery!! Thank You!! UPDATE: Gianna had her surgery (gotta love credit cards) and is resting comfortably. Hopefully she will be released in the next couple of days. UPDATE: So far $590 has been raised towards Gianna's surgery. 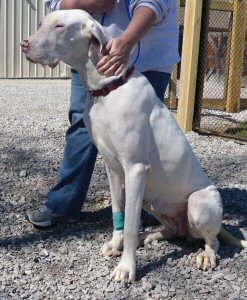 UPDATE March 13: I arrived at the rescue yesterday afternoon and am recuperating from the surgery. I was extremely tired and a bit sick at my stomach so I just wanted to rest. My new Grandma did take a few pictures of me to share with you. I now have a prosthesis to replace my injured eye so that where my eye was removed will not sink in and look as bad. I want to thank all that have donated towards my surgery $790 has now been donated. I am forever grateful for your generosity and kindness. Unfortunately the rescue still does not have a total amount due to MedVet but should the first of the week, as soon as we know we will let you know. Thanks again!!!!!! Update: $1965 has now been donated!! Thanks to all donating!!! Update March 14: I just want to thank everyone who has donated to help me. I will never be able to thank you all enough. I have always wondered what love felt like and now I know. Wonderful people that have never met me care enough to help me. Thank you!!!! Updated March 17: Just wanted to let you know that I am healing nicely! I have a appointment to go next Tuesday to have my stitches taken out. I am enjoying being an inside dog and getting all sorts of attention!! Only problem grandma says I have is happy tail, she told me to stop wagging my tail so much but I am just too happy!! Updated March 22: I had my appointment this morning to remove my stitches but it was decided to leave them in for a bit longer. Unfortunately I do have some bad news, although Grandma is telling me not to worry, I am. When I was spayed they had taken some lumps off and had them biopsied. Well the results came back as cancer. I have what is called in humans breast cancer. After a long discussion with the vet we decided that I would have a total mastectomy on April 14. They said they wanted me to recuperate totally from my previous surgeries. Plus my new vet is waiting for my medical records to be faxed, so he can review them himself. They also discussed me having chemo to prevent the cancer from coming back, they said this would be done after my surgery. Grandma also told me that if I did not stop wagging my tail so much I would also have to have it amputated as well. I promise to work on the tail wagging issue!!! My vet said he would get together an estimate and would let Grandma know what cost we are facing. The good news is that because you all were so generous with your donations for my eye surgery and MedVet reduced their cost even more that I have $1000 left to put toward my mastectomy. I am sure many of you will say why waste so much money on 1 dog, heck even I asked that question! But I am so happy and thankful for my new life that all agreed I deserved a chance for a real life!! 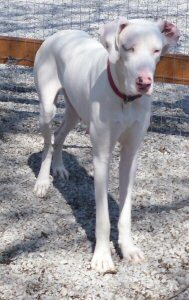 Grandma told me that once I am all healthy that a family would be lucky to have me as their Dane! Oops almost forgot Grandma attempted to take new pictures of me today all she ended up with that was useable was 1 of me running (yes I even wag my tail when I run) and 1 where I decided I was ready to go inside so I sat down on the steps and waited for her to take the hint! Update April 3: Life continues to be good!! I am just enjoying life!! Today I had a few new pics taken and thought I would share them with you! Update April 10: Well just a few more days till I have my surgery!! Grandma will give you all an update as soon as she knows something!! Please keep me in your prayers!! Update April 14: Gianna's surgery has been rescheduled for tomorrow. The vet had a emergency and we agreed to wait another day. Update April 15: Gianna had part of her surgery today. It was decided that she would have only one side of her mastectomy today plus her tail amputation. Once she recovers from these surgeries she will have the other side done. She also had a chest x-ray to be sure the cancer had not spread prior to surgery. We spoke with the vet and she was doing well after the surgery. Providing all goes well tonight she should come home in the morning. Update April 16: Well I am home and doing pretty good!! My belly hurts a bit but not as bad as I had thought it would! My next surgery is scheduled for May 3rd. 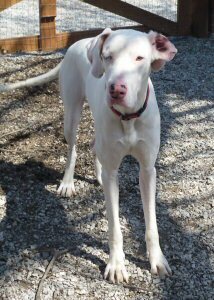 Then I will have my chemo and then watch out world I will be looking for that wonderful forever home I keep hearing so much about!!! Update April 28: Just a quick update to let you know that I am doing great!! I am healed and was planning for my next surgery on Tuesday but Grandma told me yesterday that it has been postponed. 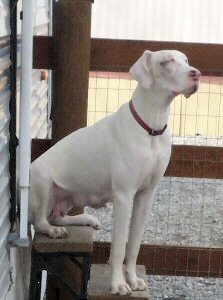 A new girl arrived at the rescue and she has kennel cough and Grandma and my vet have decided that they do not want to take a chance on me catching the kennel cough. So for now I will just have to play and enjoy life!! I will let you know as soon as my surgery is rescheduled. Update May 8: Well my surgery has been rescheduled to May 17th. I did not get the kennel cough but Grandma said she just wanted to be safe! So I will continue to pay and enjoy life till time for my surgery!!! Update May 16: Well tomorrow I have my next surgery then I will begin the chemo. I can't wait to have all of this behind me so I can start looking for a forever home! Update May 19: I had my surgery Monday and all went well. My Chemo starts in 2 weeks!! Until then I am back to just enjoying life!! Well gotta go play, I KNOW I am NOT suppose to play but I wanta!!! Update May 31: Well as luck would have it my Chemo is on hold! The stupid drug companies have it on back order!!! Grandma told me that she heard it on the news last night but I did not believe her or maybe I did not want too!!! I will let you know as soon as we hear anything!! Update June 3: Great News!! My Vet has received my Chemo (Doxorubicin) I will begin my treatment Tuesday!! Update June 7: I have received my first Chemo treatment and only have 4 left to go. The vet told me today that the treatment will be spread out over at least a 14 week period depending on how I tolerate the Chemo. There will be a total of 5 treatments with blood test in-between. Please keep me in your thoughts and prayers. Well I am a bit worn out so I am headed to bed. Update June 12: So far so good!! I thought I would get sick after my Chemo but quite to the contrary I am still feeling great!! I have a follow up blood test and check up Tuesday and then will be scheduled for my next treatment. Thanks for all the prayers they really seem to be working!! I will let you know how things go Tuesday. Update June 14: I had my blood test today and my next Chemo has been scheduled for June 28th. I will have another blood test prior to the Chemo. My vet is watching very closely what my test results are so that my body has time to recuperate between treatments. 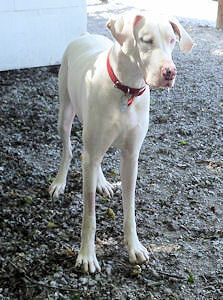 Updated June 23: Only a few more days and I will go to the vet for my next Chemo treatment. I am counting the days!!! Update June 27: Well tomorrow I get my next Chemo treatment! Hopefully it goes as well this time as the last!! I will update all as soon as possible! Update June 28: I had my second Chemo treatment today and all went GREAT!! My blood work showed totally in the normal ranges! I go back next week for another blood test and then to schedule my next treatment!! Thanks for all the thoughts and prayers!! Update July 1: Well today was not such a good day. I started the day out with a bit of an upset stomach and then the vomiting started. Grandma quickly gave me an injection to stop the vomiting!! I feel better now and am headed back to bed to rest. Hopefully tomorrow will be a better day! Update July 3: Okay life is again good! I am feeling much better today and enjoying getting pampered a bit. Grandma made me chicken & rice when I was sick Friday, I still have a bit left over and it is sure yummy! Update July 3: Well more good news!! I had my post Chemo blood work and it looks GREAT!! All counts are within normal range!! I of course am also feeling great!! My next treatment is scheduled for July 19th. Update July 17: Well only 2 more days till I have my 3rd Chemo treatment!! Hopefully I do not get sick this time! Oh well it is worth it to be cancer free!! I am just counting down the treatments till I am finished and able to find my forever home!! Update July 24: I had my 3rd Chemo treatment and just like the last time I got sick, but today I am feeling much better again. Only 2 more treatments left and I can't wait!! Update July 27: Had my post Chemo blood test yesterday and again it was great!! I am now scheduled for my next Chemo treatment on August 9th. Only 2 treatments left and I can not wait!! Update August 7: Well Tuesday is my next Chemo treatment!! I will be so happy when all of this is over!! But I know it will not be much longer!! Update August 12: Sorry I did not give an update sooner but I have just been enjoying life!! So far, I have not gotten sick from the Chemo this time! I know I probably will get sick tomorrow or something but right now I feel great!! Check out my new pics below!! Update August 14: Well I can not believe it but so far the Chemo has not made me sick this time!! Grandma and my vet have been adjusting my medications and I think they finally got the right combination to keep me from getting sick!!! I am so happy!! I have my blood test on Tuesday and then my last Chemo treatment will be scheduled!! Okay I gotta go play!! Update August 16: More good news!! My blood work results are back and were great again!! I will let you all know as soon as I know when my last Chemo treatment will be!! Update August 22: Got my date for my last Chemo it is next Tuesday the 30th!! I can not wait!!!!!!! Update August 28: Only 2 more days till I have my last Chemo! I am so excited!! Update August 30: I had my last Chemo treatment today, the vet said that I need a blood test next Tuesday and if all is good I can go up for adoption!! Keep me in your thoughts and prayers that the final blood test comes back as good as the rest!!! Update September 6: I have GREAT NEWS!!! My blood work came back perfect and I am finished with my Chemo!!! 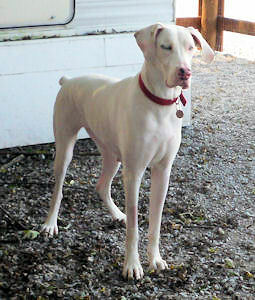 Now all I need is that wonderful forever home that I have been dreaming of!!! Update January 25: I was adopted in September and unfortunately I have been returned to the rescue to again look for a forever home. 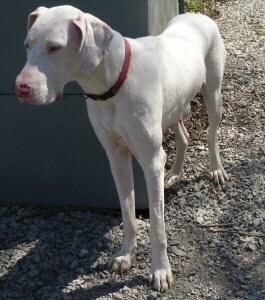 I am a very sweet and loving girl and hopefully soon I will find that wonderful forever home I have dreamed of!!! Picture above compliments of the Animal Friends Humane Society.